We went to Wilmington last weekend for the Wilmington YMCA triathlon. This was probably the first time I felt a little sad about being on the sidelines this year. The weather was nice and the last time I was here I won and had a solid day. It's hard to think about running that fast in my current state now. Everyone says, "oh you'll get back there" but from where I'm standing it seems so far out of reach. Anyways, Tassie and I watched and cheered and she got all sorts of attention (as per usual) which she looooooooved. We stayed overnight and watched FSU almost pull out the W over Oklahoma (who didn't look like a #1 team in my opinion). The next morning we ran a swim clinic. We did the first half at Wrightsville Beach where the waves and current were fun. The water temp was probably mid 70's, but the air was a bit chillier so most opted for a wetsuit. It took some squeezing, but I still sort of fit into mine. Marty took a picture since I looked pretty funny in it. Everything seems to be going smoothly as far as pregnancy is going. Of course, I have nothing to compare it to, but when I go to the Dr's and they ask if I'm having any trouble I can't really come up with anything. I'm sleeping pretty good (getting up to go to the bathroom a lot, but not too much more than normal), my back isn't hurting yet, my weight seems right on (and it looks like I WON'T pass Marty! )...and I passed the glucose test! I was worried since my mom had gestational diabetes and my score was pretty borderline but they said I just squeaked by. Phew. He is very active in there. I didn't feel him until around 21 weeks or so but he has more than made up for it now. At first it just sort of feels like when your food is digesting, then it is more definite movement and bumping, and now I swear I can feel actual appendages. This morning before I went into work Marty was talking to my belly, "Have a good day in there, Logan!" to which I added, "Yeah, have fun punching mommy all day!" Last night we had another open water swim practice at Jordan Lake. We've run several of these throughout the summer and have had a lot of fun. After most, people will hop on their bikes for a short time trial but the light is fading so we're probably done with that now. The water temp was around 77 so no need for a wetsuit but you better believe I whined like a little baby getting in. It was fine, though :) I swam some, cut the buoys when necessary, and took a break on the paddle board when I wanted. Love the picture of you in your wetsuit! 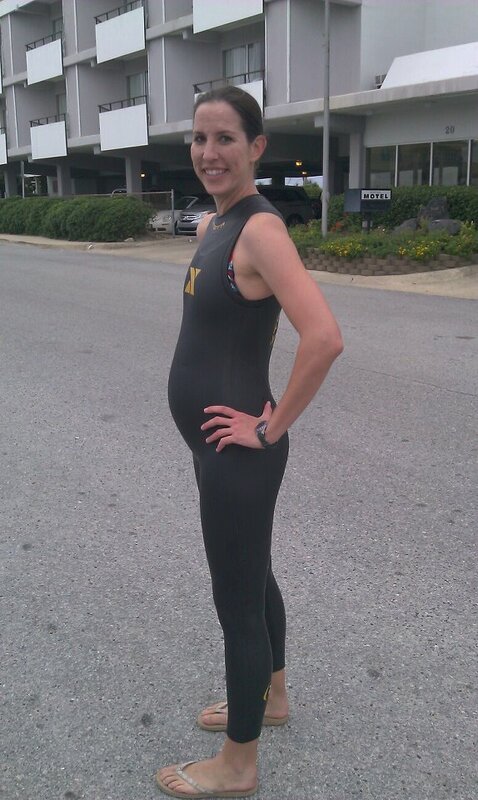 :) Geez Bri, I can't hardly fit in my wetsuit and I'm NOT pregnant!! HAHA!! Great to hear you are feeling well! You look great. I'm so jealous. My belly is already much bigger than yours and I'm only 14 weeks. Eeeks.